A man has been charged with murdering a grandmother who was stabbed to death as she supervised a lunchtime children’s party at a McDonald’s restaurant. Jackie Marshall, 57, died at the fast food outlet in Terminus Road, Chichester, West Sussex, on Saturday. Ex-McDonald’s employee Shane Freer, 20, of Batchmere, West Sussex, is due at Chichester Magistrates’ Court charged with the killing. Ms Marshall, of Southbourne, W Sussex, had worked at McDonald’s for 15 years. Sussex Police said she had been married for more than 35 years, with a close-knit family of children and grandchildren. “She was very well-known in the local area. She did a lot of charity work in the Southbourne area,” a spokesman said. Social services are offering counselling to customers who were in the restaurant at the time. West Sussex County Council said people who wanted counselling should call 01903 694422 before 0900 BST on Monday or 01243 752999 after that time. The restaurant remained closed on Sunday, taped off with police officers standing outside. A McDonald’s spokesman said the company was “shocked and horrified” by Ms Marshall’s death. A 20-YEAR-OLD man was last night charged with murder after a woman was stabbed to death in a McDonald’s restaurant during a children’s party she was supervising. Jackie Marshall, 57, of Southbourne, West Sussex, who had worked for the fast-food chain for about 15 years, died at the restaurant in Chichester, West Sussex, at about 1pm on Saturday. Shane Freer, 20, a former McDonald’s employee of Batchmere, West Sussex, is accused of her killing. He was due to appear before Chichester magistrates today. A McDonald’s spokesman said staff would be offered counselling. He added: “We are absolutely shocked and horrified by this tragic incident. A 20-year-old man has been charged with murder after a woman was stabbed to death in a McDonald’s restaurant during a children’s party she was supervising. Jackie Marshall, 57, of Southbourne, West Sussex, who had worked for the fast-food chain for about 15 years, died at the Terminus Road restaurant, Chichester, West Sussex, at about 1pm on Saturday. Shane Freer, 20, a former McDonald’s employee of First Avenue, Batchmere, West Sussex, is accused of her killing. He is due to appear at Chichester Magistrates’ Court. A Sussex Police spokeswoman said Mrs Marshall was pronounced dead at hospital. She added: “Mrs Marshall was married for over 35 years. She’s got a very close-knit family. She’s got children and grandchildren. 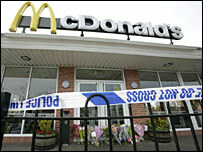 A McDonald’s spokesman said: “We are absolutely shocked and horrified by this tragic incident. Our thoughts and sincerest sympathies are with the family of a much loved, valued and respected member of our team.